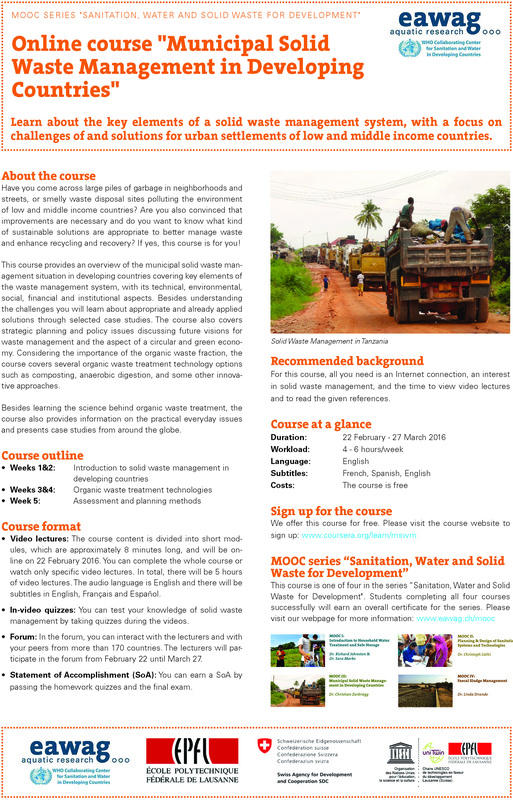 Sandec/Eawag and EPFL will launch the third MOOC of the series “Sanitation, Water and Solid Waste for Development” on 22 February 2016. The five-week course will be offered for free on the internet-platform Coursera, and the videos will be in English with French and Spanish subtitles. 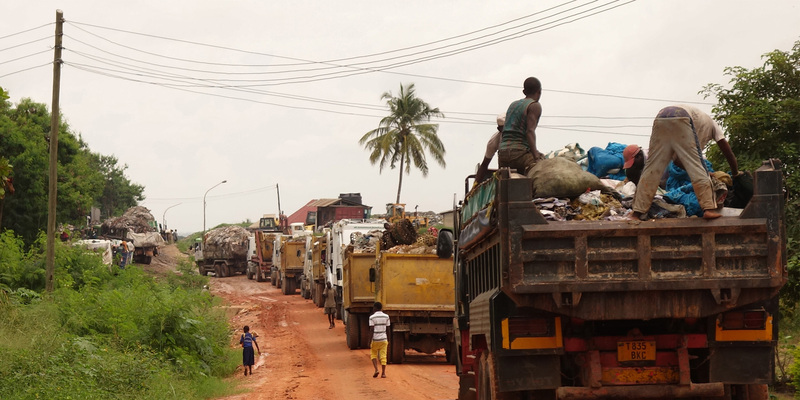 The course will cover the current waste situation in low and middle income countries, the physical and governance aspects of a solid waste management system, including planning and evaluation methods. It will have a special focus on organic waste treatment technologies. Please sign up for the course here, or watch the trailer and get more information on our MOOC webpage. The Sustainable Development Goals – what can Swiss actors contribute? This event, jointly organized by Eawag and the Swiss Water Partnership, aimed at informing about the ongoing development of the monitoring architecture of the newly adopted 2030 Agenda for Sustainable Development. Speakers from Eawag, WHO (JMP), GIWEH and WaterLex presented and discussed the ongoing development of the monitoring architecture, the key challenges to be addressed towards implementation. Selected initiatives were also presented. Cewas is currently developing and implementing offers of support to Swiss organisations and their partners in the global south who are working in the water sector and want to establish integrity in their processes, projects, programmes and organisations. This survey is designed to help Cewas in adapting the offers to the needs of the organisations as good as possible. Thank you for taking 10 minutes of your time to answer the questions before December 7th 2015. Water, jobs and sustainable growth (including the links to the implementation of the 2030 Sustainable Development Agenda). You can find more information on the thematic scope in this document. 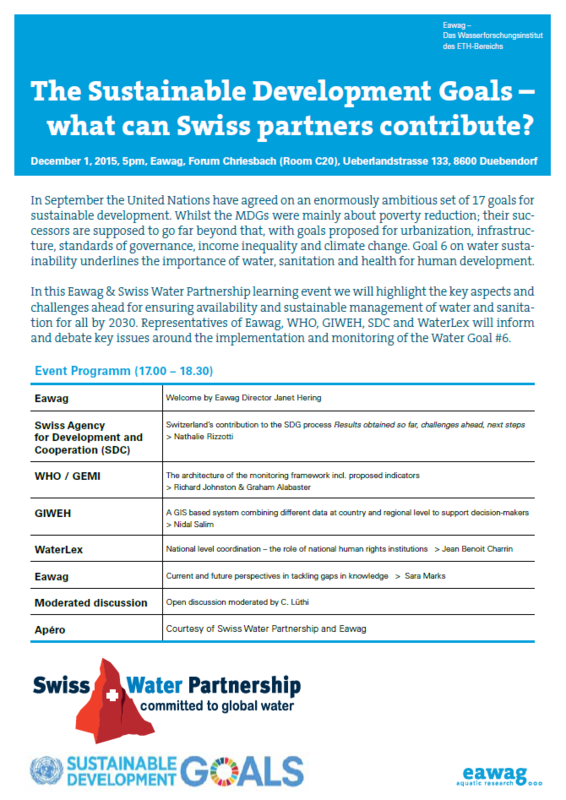 This year again the Swiss Water Partnership (SWP) intends to host thematic events and workshops. Please take some minutes to complete this small survey regarding your intention to participate at the Stockholm World Water Week and your inputs regarding topics for joint thematic events. The annual SWWW is a key international water event which attracts over 3’000 key decision makers in the international water sector. The SWP coordinates the submission of proposals and the execution of thematic events (seminars and workshops). 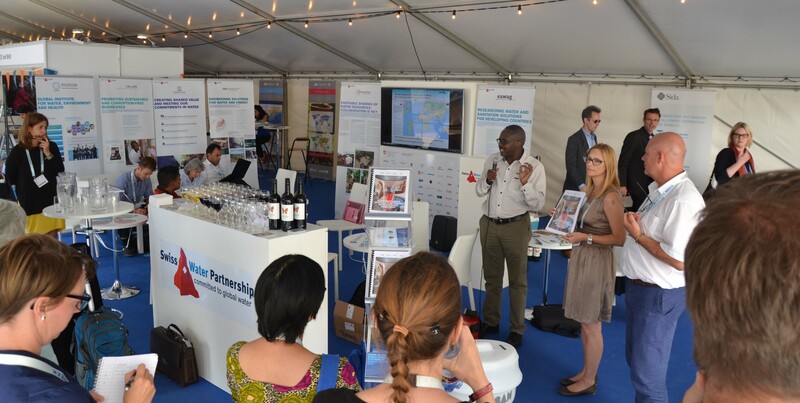 Furthermore the SWP develops and implements a Swiss booth together with its members.The thematic events and the Swiss booth attract international water decision makers and provide an opportunity to present, collect critical feedback and network with international experts. SWP members are encouraged to propose themes for a joint thematic event. The SWP Secretariat supports them in developing a competitive proposal and finding relevant partners. For now the SWP Secretariat would like to collect the idea of themes for the thematic events in order to identify potential seminar topics. Based on the ideas collected on the previous page, the SWP Secretariat would like to have a first discussion with the interested SWP Members in order to identify themes and working groups for the preparation of joint thematic events. We would like to kindly ask you to take 10-15 min to fill in this short Capacity Development Survey. Your added value: your interest will be taken into account when we design the first pilot training and you can position your organisation as resource organisation on specific topics. Finally, a deeper understanding of the SWP expertise helps position Swiss water expertise internationally. We will organize a tombola with all the respondents: two CHF 500 vouchers will be awarded to be used as discount for SWP 2016 training. Please send back the excel survey (link does not open on Firefox) by November 30 to Anne Sophie Aublet. The 8th SWP SB meeting took take place on October 13th at CSD Engineers in Fribourg. This is the first meeting of the board since re-elections last May.The two SWP co-chairs, Olga Darazs and Thomas Zeller, were re-elected unanimously by the board. This visit took place within the framework of the SWP’s efforts to develop partnerships with major actors and create the ground for cross-sectors projects. 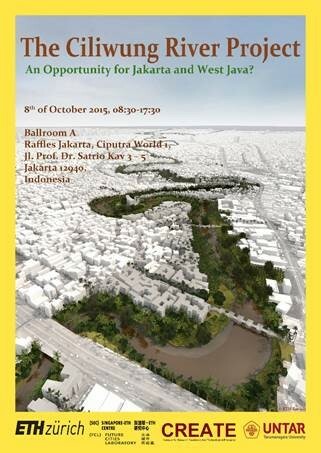 The SWP, following an invitation by the ETH Zurich, participated in the Ciliwung River Project Conference as a panellist in Jakarta on October 8. The Conference aimed at presenting the results of the ETH research project and raising interest among donors and other actors to pursue the Ciliwung River Project (from research to implementation). This was an excellent opportunity for the SWP to start assessing the potential for the SWP members to get involved in cross-sector projects in the region. The ETH Ciliwung River Project resulted in a model integrating environmental engineering, landscape architecture and ecological assessment. The project results highlight the potential of river rehabilitation by demonstrating that a ‘green’ river corridor maximises the benefits of ecosystem services. The model helps assess the impact of different parameters such as land use management and channel width on the frequency of flood events and groundwater re charge. An important focus was on identifying priorities with regard to the ecosystem services (e.g. a riverside park providing recreational value in addition to buffering capacity) that the river and its catchment can provide. In particular, the dynamic visualisation (landscape design solutions) supports dialogue with the public on the effects of different scenarios. Based on the preliminary assessment, the potential in terms of niche for SWP expertise and funding opportunities is rather positive. Still the question remains whether local actors would be ready for a paradigm shift (from channelling towards river rehabilitation). We will further deepen this assessment in the coming months and come back to you with more information.